The Disney Soda Fountain has released the Back To School ID card series on Saturday, August 31st. Each is a Limited Edition of 400 (which is a higher number than usual) and sold for $14.95 each. The characters in this series are Chicken Little, Sulley, Vanellope von Schweetz and Jessica Rabbit. It appears both the character picture and the crest will be a pin-on-pin element. Jessica's headshot is to the bottom right of the pink ID card. She's looking very studious in her white collared shirt. 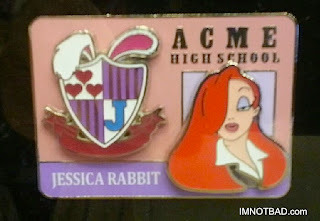 Above her photo reads "Acme High School." The crest off to the left features Roger's ears, hearts and a blue letter "J." 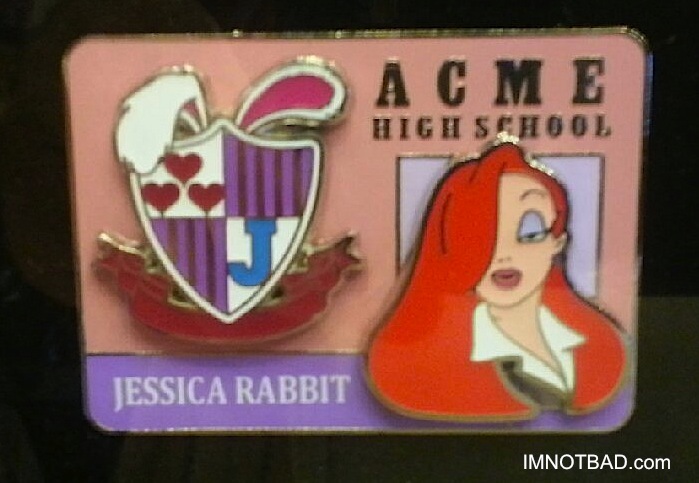 Jessica Rabbit's name is printed in white at the bottom.